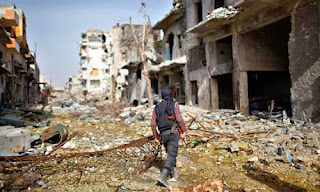 After over 100,00 people have been killed in the Syrian Civil War and 2 million have been forced from their homes out of a population of 22,505,000, the fighting may be coming to a halt. The Syrian opposition group against Assad is the Syrian National Coalition, backed by the West. These rebels are outgunned by the regime forces who have gained speed since Assad agreed to give up his chemical weapons stocks and has thrown off the threat of of imminent US military action from jet planes. Deadly battles have been taking place, however. The Sunni town al-Mitras of 8,000 lies in an area dominated by Assad's Alawite Shi'a sect where a lot of shelling has taken place. Assad's soldiers want the surrender of dozens of fighters in there. The town's officials persuaded defectors and rebels to surrender to the authorities with the promise of being freed after "repenting." This ploy has often been used in stalemates in Syria such as the recent one in Talkalakh. Bayda and Banias, nearby Sunni towns, is where troops killed 248 people after days of shelling. Syria is 13% Shia like Iran and the Alawites are a Shia group which is why Iran backs Assad. The Twelvers and Ismailis follow that sect. This is a Civil War of religion more than it is about politics with the 2 intertwined. With either group, the worst thing to be was Jewish even though both Sunnis and Shia could be carrying some Jewish genes since Jews lived in the area since King David of Israel who lived from 1010 BCE to 970 BCE. Syria was part of Israel-Judah which the Bible called Aram. The coast had been settled in those days by the Phoenicians. In the 8th century BCE, Syria had been overrun by the Assyrians who had also attacked Israel in 721 BCE. Assyria itself was an ancient state in western Asia whose people were also Semites and had established an aggressive kingdom in the 20th century BCE. I think a lot of the present day Syrians must have inherited some of that aggressiveness. Sunni Muslims are the majority and dominate the revolt which started in March 2011, inspired by the Arab Spring in Egypt. Christians and other Muslim sects have been on the side of the regime, which is surprising because the regime was so terrible to the Jews of Syria that they finally were forced find ways to escape. In the end, a Canadian woman helped to get them to Israel and the USA in 1994. After the creation of Israel in 1948 the Jews in Syria were terribly persecuted. This was far worse than the Jews of the Middle East being treated as dhimmis or 2nd class citizens which was bad enough where they had no rights as real citizens. Instead, they had restrictions and had to pay a poll tax others did not have to pay. Rights were taken away such as owning their property, travel or even to practice their occupations. If they tried to leave the country they were persecuted. If they were Jews who needed to travel for business purposes they had to travel alone for fear they would flee to a free country. The big fear of the government was that the men would join the Israeli forces and fight against them in the Israeli army. Here in Aleppo, the 3,000 year old Jewish history went back to King David. Damascus's Jewish community also went back to that period and both went back to Jews entering the country after the 1492 expulsion of Jews from Spain's Spanish Inquisition. Why the Christians stand with Assad seems artificial if they are for freedom. Beautiful neighborhoods of modern homes have been bombed away. New homes have been flattened in communities that were modern with all the amenities of a Florida home. Cemeteries guarding genealogy for families have been destroyed. Assad has been reported to have secretly moved chemically tipped missiles over to Lebanon, now. That's what happened most likely to the same chemicals that started in Iraq. The last I read was that Assad may not seek another term. How sad. He's finally getting the message that he no longer is finding favor with his people. He'll probably take his money and hide out in South America. Update: 10/9/13 Since 1,400 people were killed by Sarin gas attacks on 8/21/13 in Syria, 100 experts will arrive in Damascus today to expand on work by the first team that came on 10/1/13 to find and see to the destruction of these chemicals. They have to identify, sequester and oversee about 1,000 tons of the chemical arsenal and have about 8 months to do the job. The actual work of it is to be done by Syrian forces. Their job is to verify that Syria has destroyed the entire arsenal which is to be done by mid 2014. Resource: Oregonian newspaper 10/6/13 page A11, Bloodshed precedes cease-fire agreement by Bassem Mrous, AP. Fighting is now turning towards Israel. "Two Syrian armored brigades set out from Damascus Monday night, Oct. 7, to link up with forces already fighting in southern Syria to reach Quneitra opposite the Israeli Golan border." That needs watching. It's too close for comfort. A mortar exploded from Syria in the Golan Heights today, injuring 2 IDF soldiers. The question is, was this intentional or a spillover from their own warring. Complaints have been filed and the source is being investigated. If on purpose, there will be retaliation.